Veterans Day provides an opportunity not only for the New Orleans community to thank service men and women for their contributions but also to take inventory of some of the resources in place to assist these heroes, since homelessness and isolation are often two hurdles veterans face after service. This year, the Department of Veterans Affairs provided $6.5 million in funding to open a new Community Resource and Referral Center (CRRC) in the New Orleans VA hospital. Along with other agencies, the CRRC will provide a resource hub to help veterans secure access to housing and health care services, including homelessness prevention, individual recovery plans, housing referrals and supportive services. “We have no greater mission than to prevent and end homelessness,” says Julie Catellier, Southeast Louisiana Veterans Health Care System Director. A community network is so important to veteran Dylan Tete that he’s creating one through his nonprofit, Bastion, which aims to prevent isolation and estrangement through built-in supports. “All too frequently, when a veteran with a TBI [Traumatic Brain Injury] departs post-acute care, the community isn’t equipped to ensure [his or her] viability as a healthy, participating member,” says Tete. “It is the lack of community that imperils and undermines reintegration.” To that end, Bastion is building a facility to combat this cycle. While plans for the facility are still underway, the preliminary, conceptual architectural rendering for the space illustrates the organization’s goal of developing a community of support to injured veterans and families. 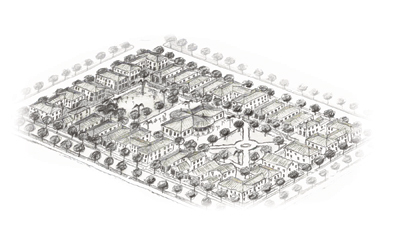 Bastion, together with Tulane City Center, will host a design charrette on Nov. 11, Veterans Day. Whatever the format, the structure will provide what Tete refers to as an “intentional community,” a housing program where injured veterans live alongside retired military and civilian volunteers in a traditional neighborhood environment. For more information, please visit JoinBastion.org, NolaVFW.org or NewOrleans.va.gov.